Black Sails has been a high profile project for Starz ever since it was initially announced. The period drama is preparing to set sail for Season 2, and this weekend the subscription cable network dropped some bombshell news, as well as the first trailer for Season 2. It’s pretty epic as far as trailers go, and you can check it out, below. When last we left Captain Flint and the gang, they ended up just short of reaching their goal of plundering the Urca de Lima. Instead, they got into the fight, which will leave them stranded at the beginning of Season 2. We don’t get to see the semantics of the setup, but we do get to see Flint and John Silver scheming together. Far away, Eleanor is attempting to hold on to her livelihood, noting that she is in an enviable position and that many people in England would be interested in taking it from her. The clips coordinate with the plot description Starz released earlier this month. We also get a first glimpse of Ned Low, who will be played by Tadgh Murphy. Not only does he seem vicious, he also seems to be in cahoots with Charles Vane, which could be a problem. Right now I’m more concerned with the man’s messed up eye. The brand new trailer is great, but Starz has more news for fans. 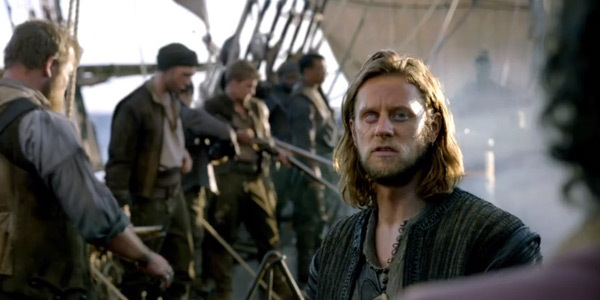 On Friday, the network announced that it has renewed Black Sails for a third season. It’s not shocking that Starz would want a third season of the drama, but the timing is definitely surprising. Two summers ago, Black Sails signed on for Season 2 before Season 1 even premiered. Now, the show is signing on for Season 3 before Season 2 actually premieres. It’s a move that is good for the creative team, as they can plot out cliffhangers at their leisure. Starz didn’t release much information related to the Season 3 renewal. We do know that the show’s episode order has been upped in Season 2 from eight episodes to 10, so hopefully that will be the Season 3 trajectory, as well. I’m sure we’ll be hearing more about Season 3 down the road, but for now we can focus on Season 2. As Flint notes in the trailer, “judgment” is coming, and it’s hitting the schedule on January 24, 2015 at 9 p.m. ET.